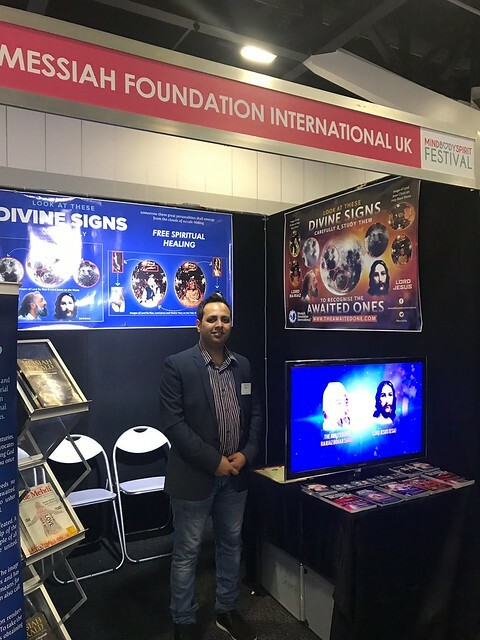 Recently, Messiah Foundation International Australia participated in the Mind, Body, Spirit Expo in Sydney from the 4-7 October 2018. Over 15 000 people attended from all over the world. More than 10 000 people saw the divine signs and images of HDE Lord Ra Riaz Gohar Shahi on the Moon and Holy Black Stone. There, our team displayed large banners depicting the images of Lord Jesus Christ and HDE Lord Ra Riaz Gohar Shahi. Our team also offered free spiritual healing and Opening of the Spiritual Heart through the divine image of HDE Lord Ra Riaz Gohar Shahi to many loving souls who instantly felt peace and spiritual ecstasy.